This post was submitted by Patricia Meyer as part of our community themed Divi Summer Sale week. Each day of the weeklong sale we will be publishing new stories submitted by community members about how Divi has helped them build their careers and businesses. My website design career started in the late 1990s. At the time the options for designing websites was slim at best. You had PageMill by Adobe, FrontPage by Microsoft, and Dreamweaver by Macromedia. None were friendly, and as far as design went, your options were very limited. By the time Adobe bought Macromedia in 2005, Dreamweaver had become the standard in the industry and is what I used up until 2010 when I switched to WordPress. In the beginning, I would design a website in Dreamweaver, and then upload it to a website, that I can’t remember the name of, and for $10.00 the program would convert my HTML file to the appropriate WordPress files. By 2011, I started using the WordPress 2011 theme and building child themes off that. Coming from a print design background, I happen to love columns. To say designing columns where a challenge would be an understatement. Yes, there were table plugins, but they were awkward. The best way for me to achieve what I wanted was to design everything in Dreamweaver and then paste into the “Text” section of a WordPress page or post. That remained my process until late 2014 when I discovered Divi. When I first looked at the backside of a page designed with Divi, I thought it was Christmas. There were columns everywhere. I could add as many columns as I wanted. Better than that though, I could have one row with 3 columns and the next row with two and the next with one, or whatever I wanted. To date, I can’t remember the last time I opened Dreamweaver and I haven’t missed it. With me getting more and more comfortable with the Visual Builder, I find the design process even more enjoyable. In many ways it does remind me of my days designing before I switched to WordPress, only without having to spend endless hours writing code. As great as this has been for my sanity and design business, with the switch to Divi other possibilities came along too that have been just as impactful. In its beginning stage, I was one of the first Divi Fixr’s. From that, I authored the book, “Dos and Don’ts + 30 Divi CSS Snippets + Manually Moving WordPress.” When time permits, I enjoy designing Divi child themes. Currently, I have one called Reunion, and another called Non-Profit. I create these things not only because I like to be helpful, but because in this instance being helpful is also good business. The Divi theme comes with one of, if not the, largest premium WordPress theme community on the web. And while it wasn’t a part of my plan when I began using it, providing valuable resources to the Divi Community has further expanded my design business to include products as well as the design services I began with. My two child themes were design for groups and non-profits with limited budgets, but who needed a web presence. They are designed so all one has to do is change out the text and images, and they are up and running in no time. The book comes from the questions I was continually asked as a Divi Fixr as a reference guide. 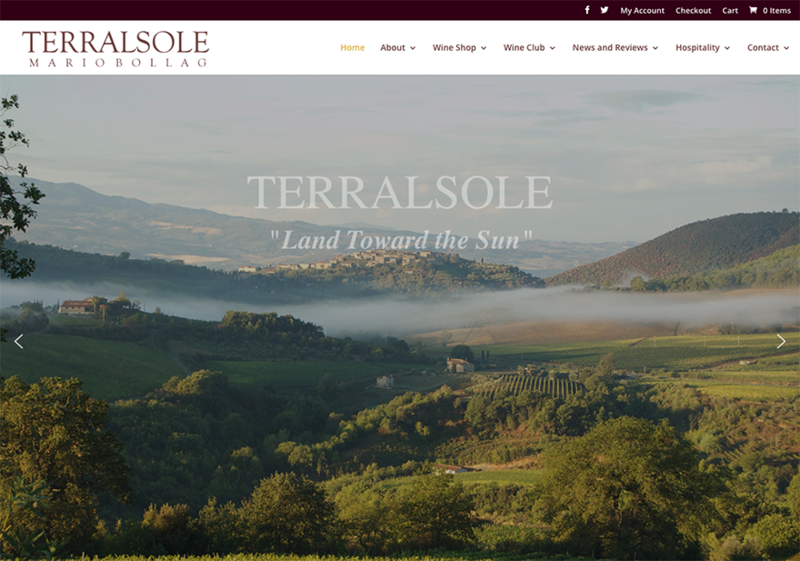 Perhaps the best thing that came from using Divi was the website design I did for the Italian winery Terralsole, where I won the American Graphic Designers Award and was featured on awwwards.com. It took my breath away when I found out I had won the award. I later found out I was in the company of designers for companies such as AARP, AT&T, Barbie, Breyers, and many other of the “big boys.” When I first read the letter, I had tears in my eyes and I’m not sure I would have accomplished this without the ease of Divi in obtaining the look I wanted. I have big shoes to fill after winning the award and I’m ready to do it. The future looks like people are switching from child themes to predesigned layouts and I have a few of those in the works. Actually, I have many irons in the fire right now, one which has just launch is my new “Ready.Set.Launch. !” program. None of this would not be as easy to accomplish if it were not for Divi. If only Divi could give me more hours in the day! I'm the content manager here at Elegant Themes. In addition to writing blog posts I edit our blog, host our Divi Nation Podcast, and manage our many content contributors. Through our daily tutorials, popular social channels, and growing meetup community it is my mission to help make The Divi Nation the most empowered community on the web.